Open Sunday..3/24 ...1-3:30 Mediterranean Villa in NAA with magnificent landscaping including mini vineyard, veggie garden, lawn, fruit trees, covered ramada with wood burning fireplace, veranda, , fountain, etc. 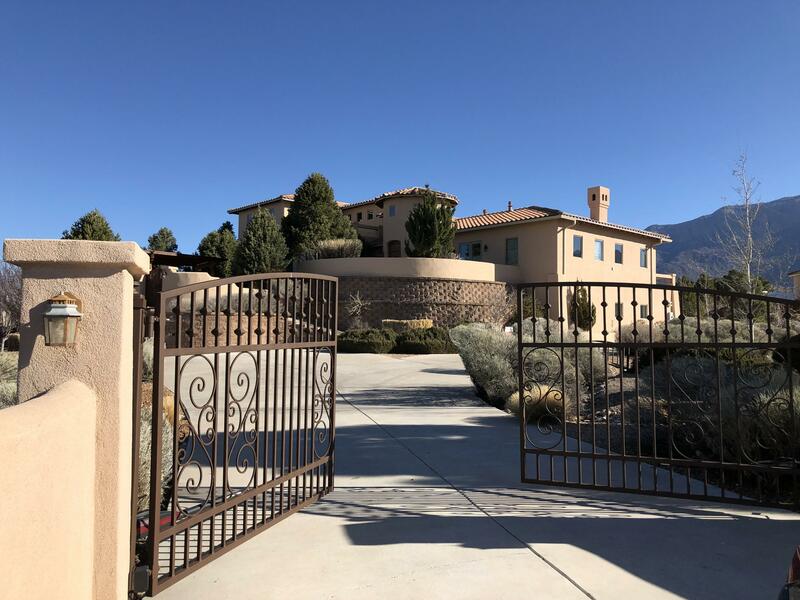 Step into the circular entry rotunda surrounded by clerestory windows & then onto solid wood floors into the living room with a window wall facing the Sandias with magnificent views.. The high ceilings have rough hewn beams as does the kitchen & family room. There's a giant gas fireplace , wet bar, & a ''Princess Staircase'' with Travertine flooring leading to the private, upper Master Suite . The kitchen/Family room is large with a center island, abundant seating, stainless steel appliances with dbl. ovens, gas cooktop, subzero refrigerator, granite countertops & custom wood.